If you’ve been around FMITK before, you know that I love an Asian twist on a comfort food favorite. The first time I ever had a *real po’boy was at Perino’s Seafood in New Orleans. 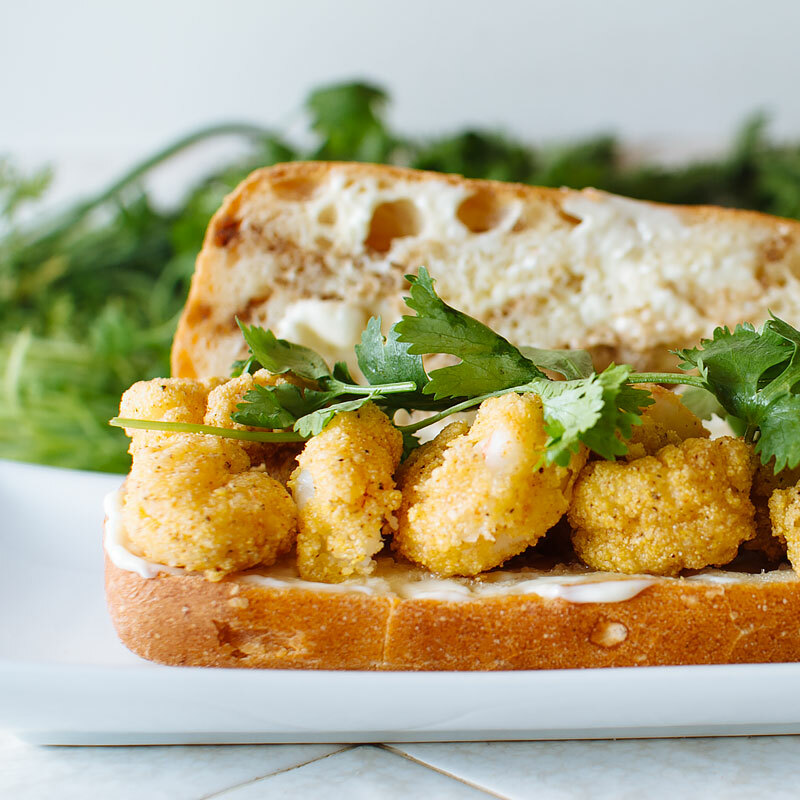 I still vividly remember a sandwich so stuffed with deliciously hot fried shrimp that they were falling out with every bite, then washing it all down with a pineapple Big Shot. 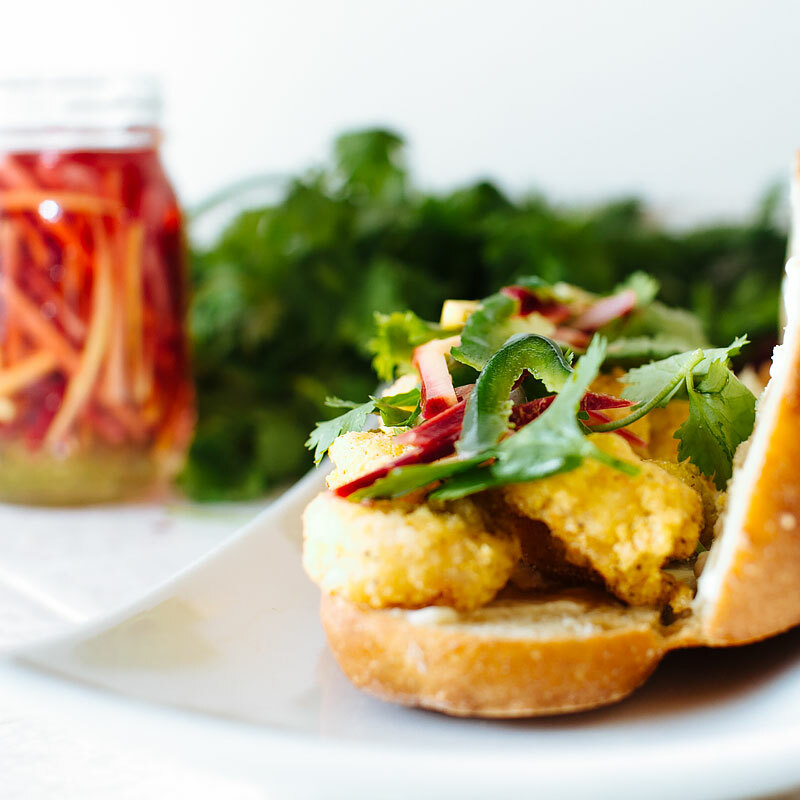 The first time I had a bánh mì was from a little place called Bale French Sandwiches in San Diego – perfectly pickled veggies, BBQ pork and pâté on a warm, soft baguette. I immediately fell in love with the how well-balanced each bite of sandwich was – spicy, sweet, sour, salty… everything! 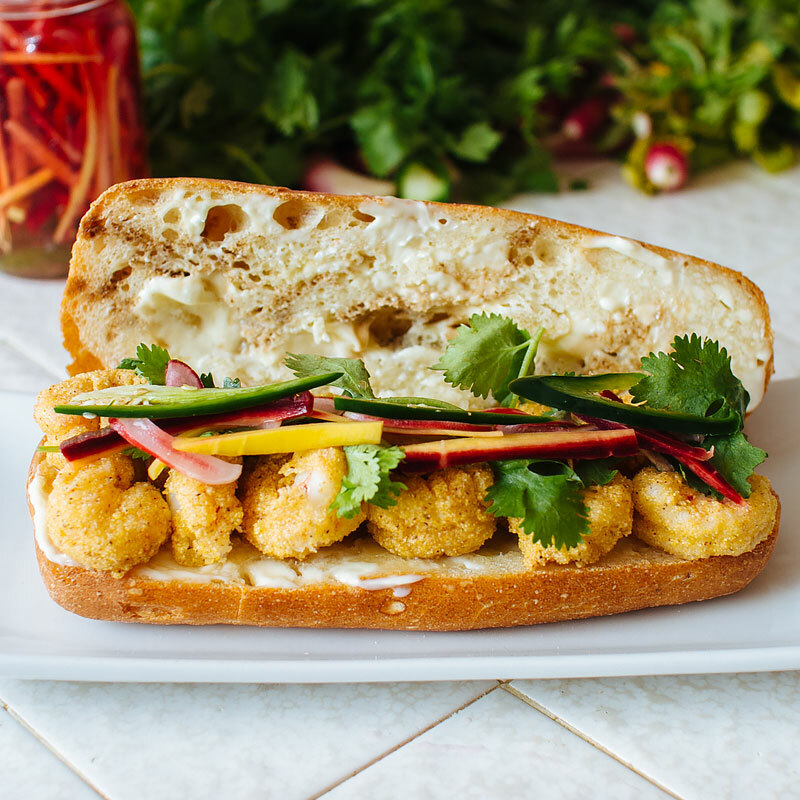 With all of that said, this recipe is my ode to the po’boy and the bánh mì – the Po’Mì! 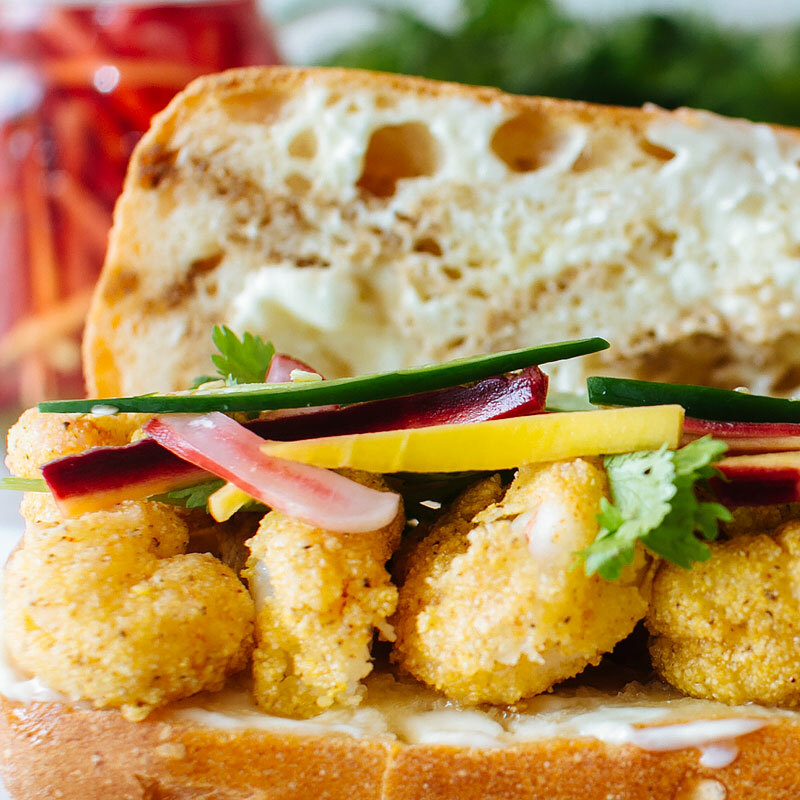 You’ll need baguettes (or your favorite bread of choice) sugar, flour, creole seasoning (I like Tony Chachare), cornmeal, vinegar, shrimp, carrots, radish (or daikon), jalapeno and cilantro. 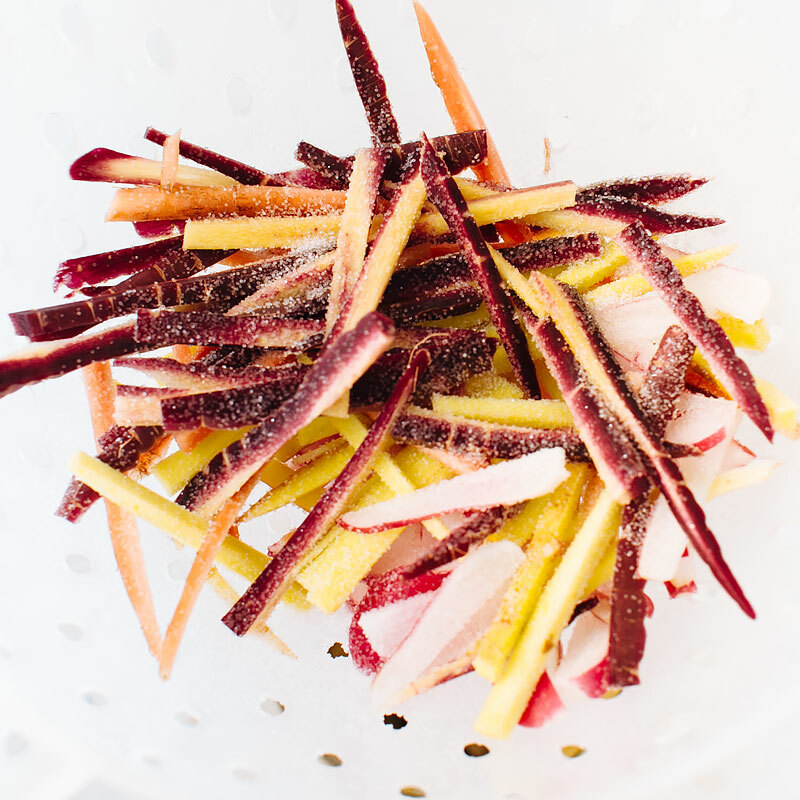 Cut the carrots and radishes into matchsticks. I’m using rainbow carrots and red radishes because that’s what was at the farmer’s market that day. Use whatever you fancy! Sprinkle with 1 tsp salt and 2 tsp sugar, and massage into the veggies. 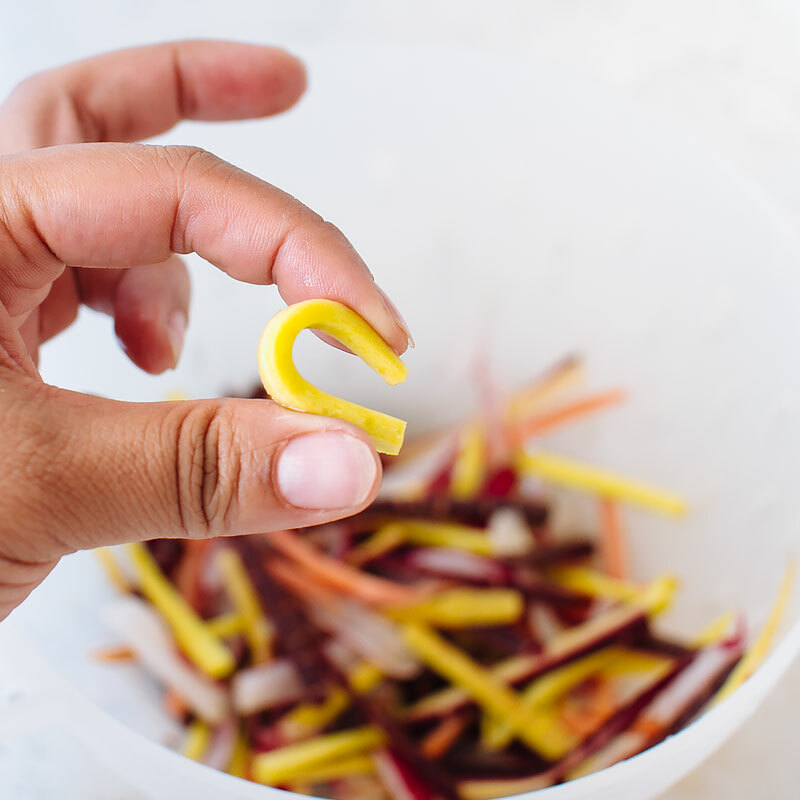 Once the veggies can bend without breaking, you’re ready to quick pickle! Rinse the salt and sugar off with cool water. Place the veggies in a clean jar. In a separate bowl, combine vinegar, warm water and sugar. Stir to dissolve. 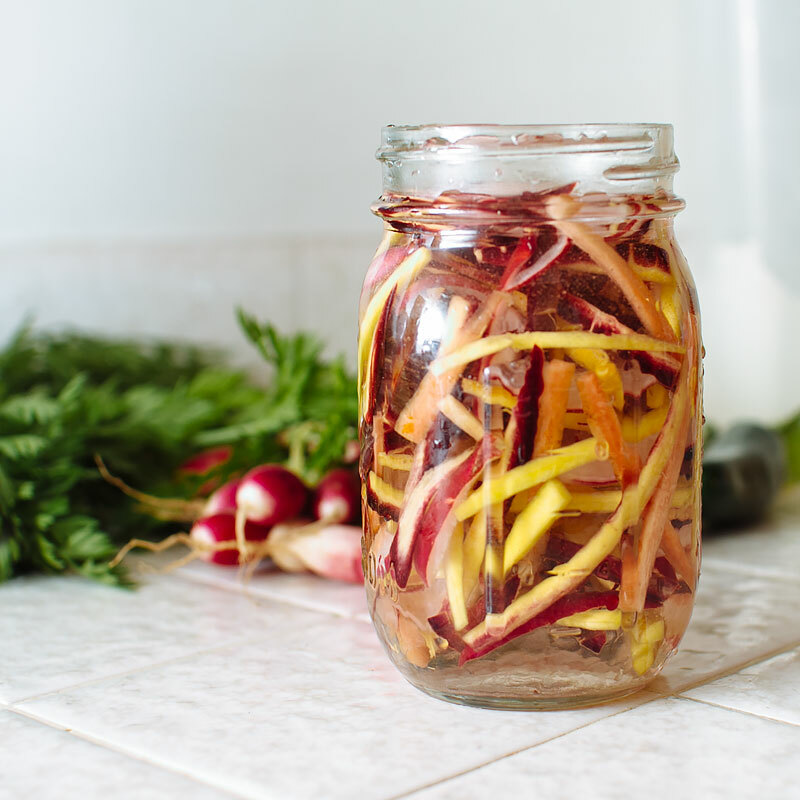 Pour over the vegetables and let pickle for an hour before enjoying. While the pickles are pickling, combine the cornmeal, flour, creole seasoning and seasoning salt for the fish fry. 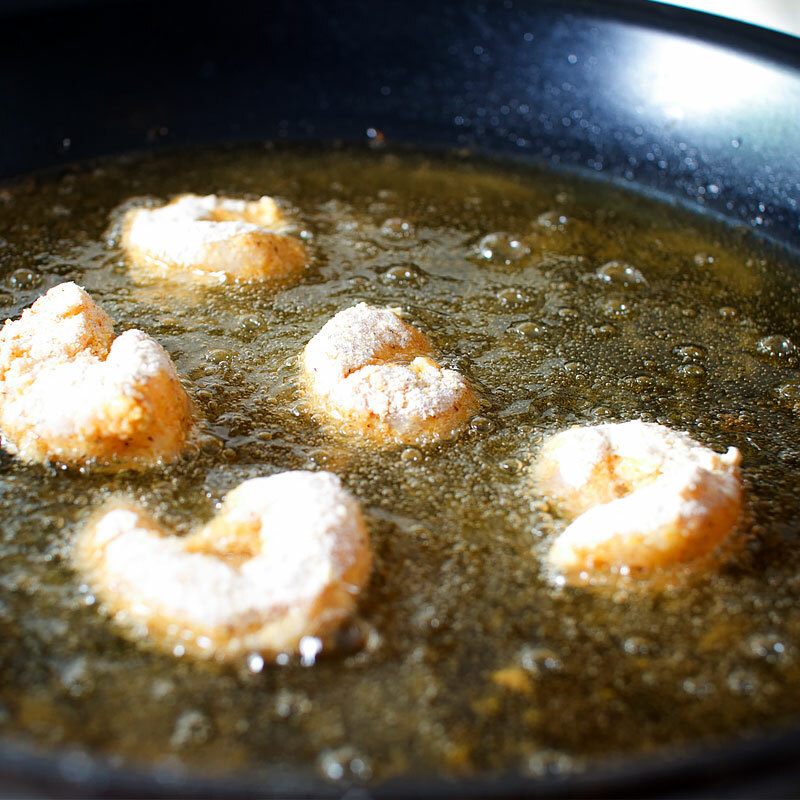 Dip the shrimp in milk, then dredge in the flour mixture. Shallow fry (about 1/2″ oil) until cooked through and crispy on both sides, about 2-3 minutes. 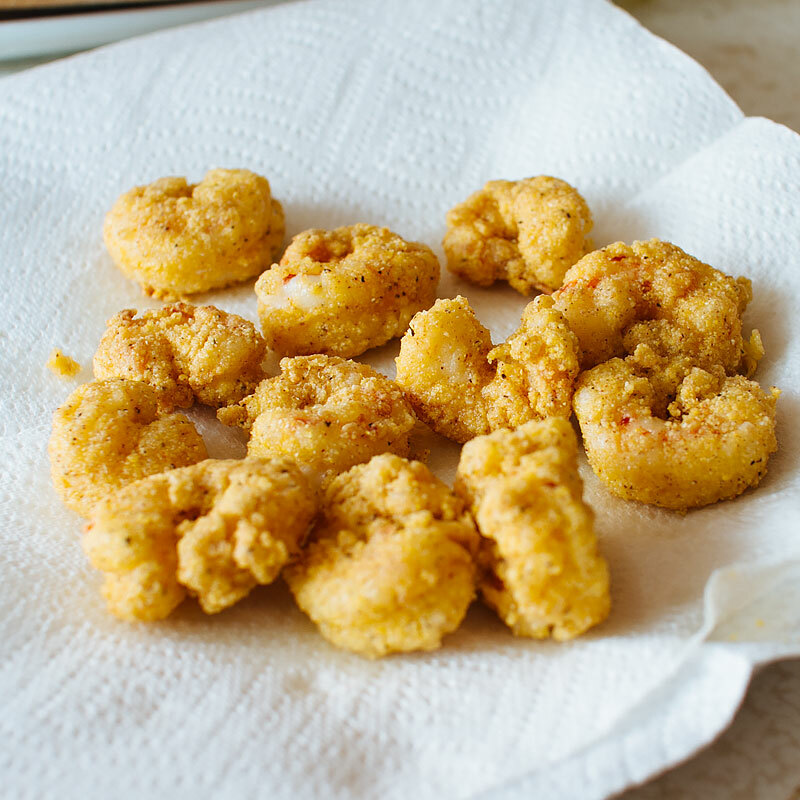 Drain the fried shrimp on paper towels. Try not to eat them all. Split open your bread of choice and place mayo on both cut sides. Sprinkle with hot sauce on one side, Maggi seasoning on the other. This is totally optional and totally necessary. …and pickled veggies and jalapenos. 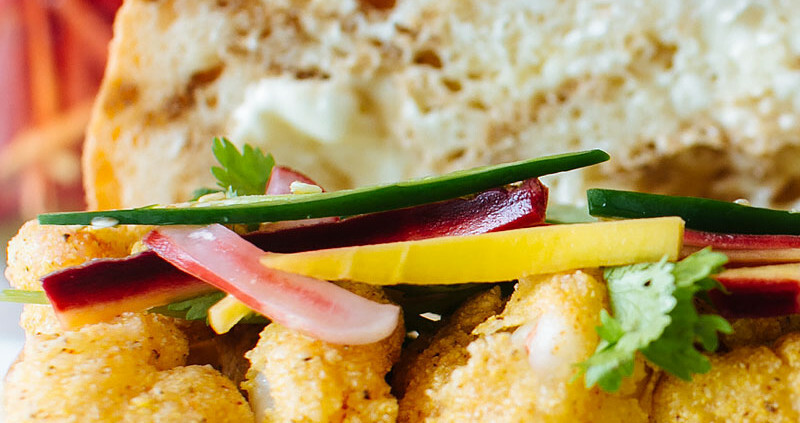 The pickled veggies pretty much make the sandwich for me. And the shrimp. And the Maggi seasoning. 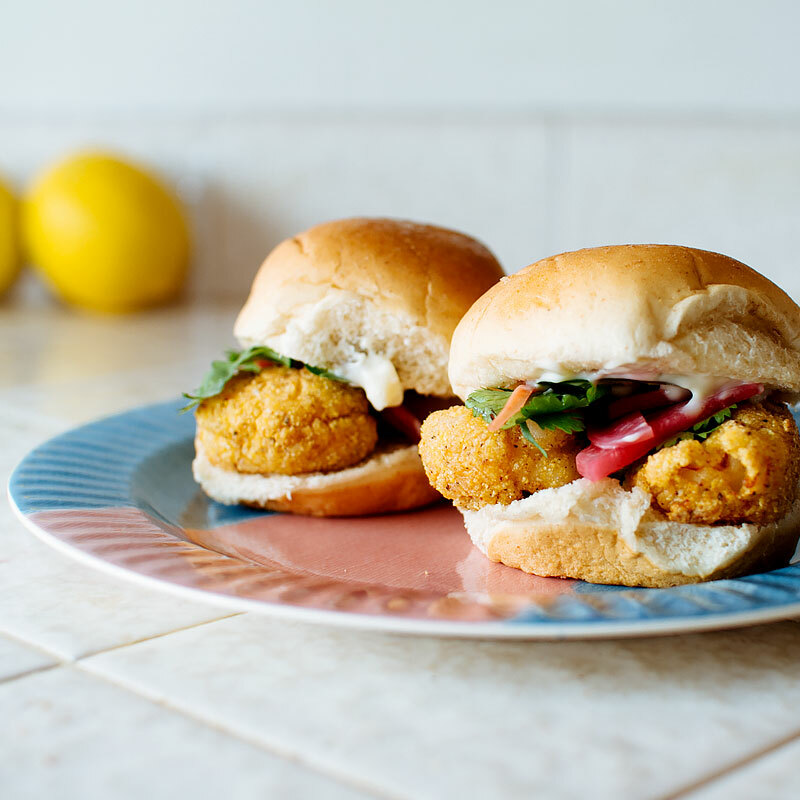 You can also do these and delictable little mini sliders! You know how I feel about mini thinggggggs! Place the carrot and radish in a bowl and sprinkle with 1 tsp salt and 2 teaspoons of the sugar. Use your hands to knead the vegetables for about 3 minutes. This helps remove some of the liquid from the veggies. Once they soften, liquid will pool at the bottom of the bowl. Stop kneading when you can bend a piece of carrot so that the ends touch but the turnip does not break. Drain in a colander and rinse under cold running water, then press gently to remove extra water. Transfer to a clean jar. Combine the remaining 1/2 cup sugar, vinegar, and the water and stir to dissolve the sugar. Pour over the vegetables. The brine should cover the vegetables. Let the vegetables pickle for at least 1 hour before eating. They will keep in the refrigerator for up to 4 weeks. In a large skillet, heat about 1/2" of vegetable oil over medium-high heat. 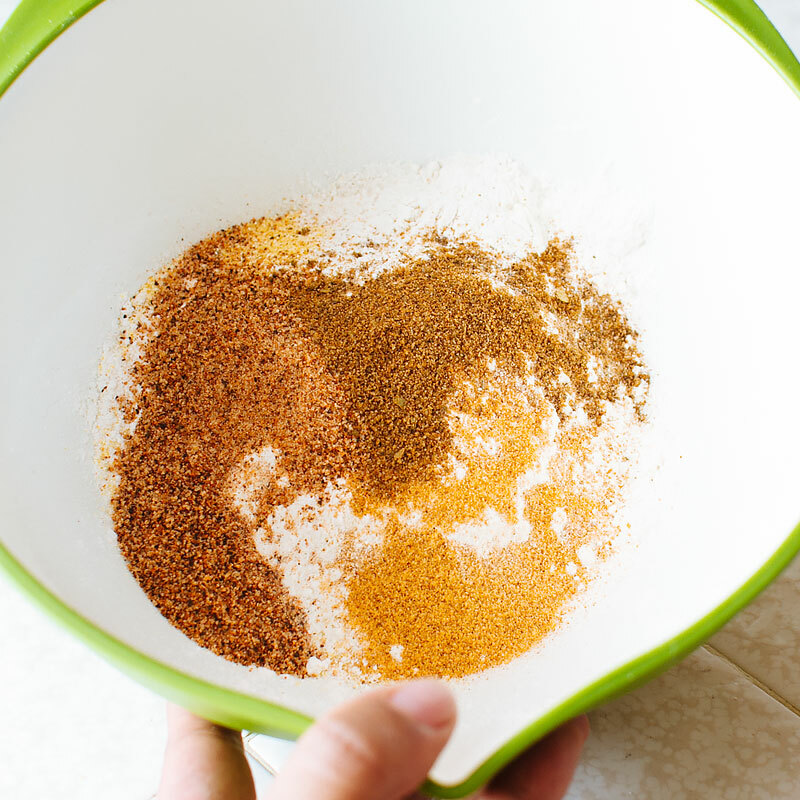 Combine the cornmeal, flour, creole seasoning and seasoned salt in a bowl and mix well. Dip the shrimp in milk, then dredge in the cornmeal mixture. Fry until cooked through and crispy, about 2-3 minutes. 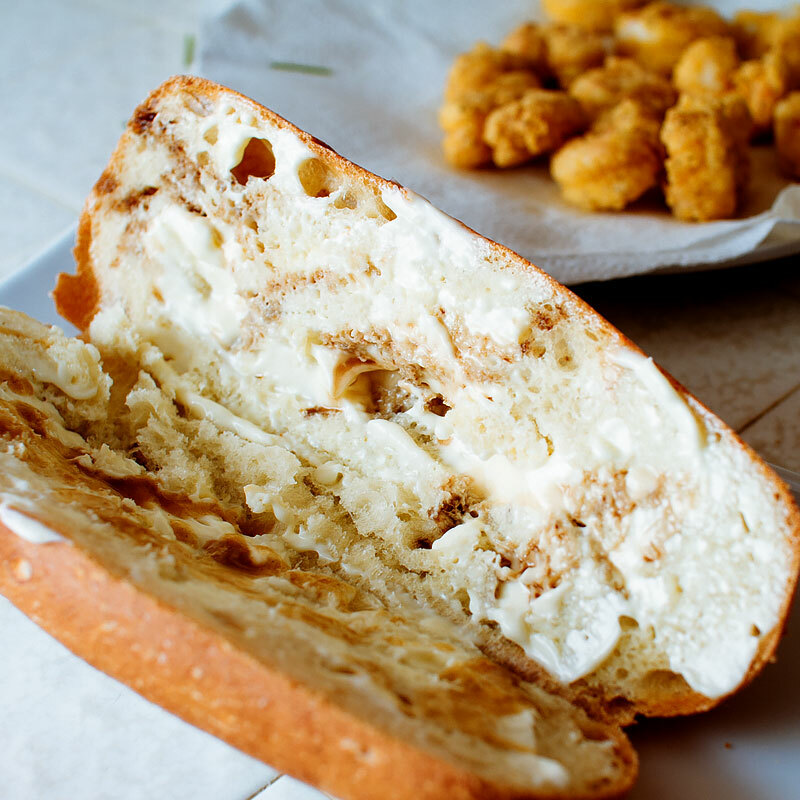 Split your bread in half and spread both sides with a thin layer of mayonnaise (or more to taste). Sprinkle with hot sauce and Maggi seasoning (optional). 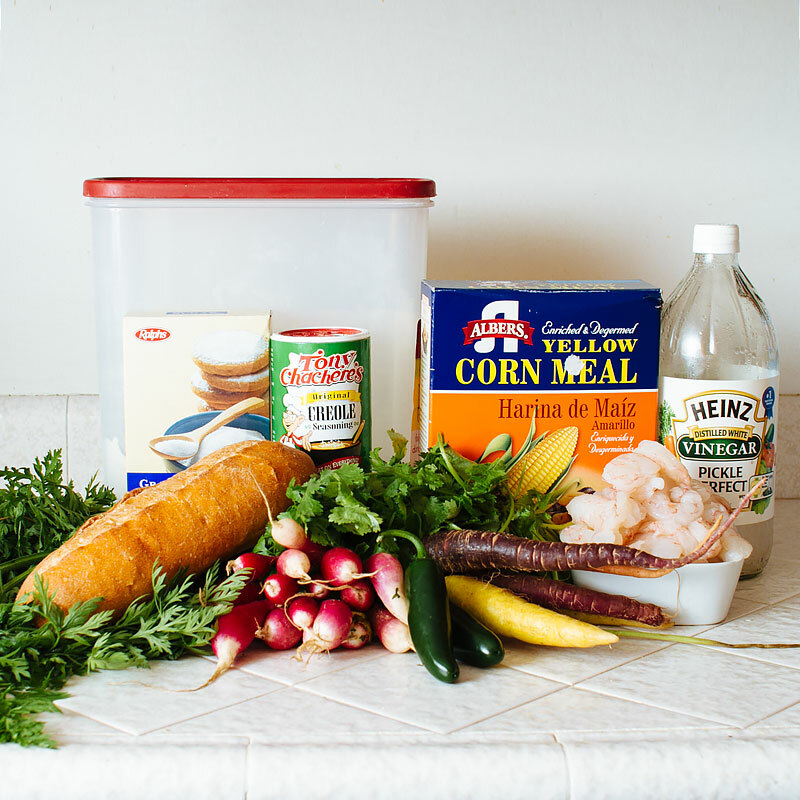 Place shrimp down, followed by cilantro, pickled veggies, and thinly sliced jalapeno. Devour.